A showroom floor is not the place where you begin your research about a particular model, unless you are a cold customer i.e. someone who does not plan to buy a car in the next few days. The chances of you making an impulsive decision are high if you walk into a dealership without researching about the car. The dealership folks will always try to overwhelm you by promising greats deals in order to sell you the car then and there. You need to do your homework before walking into a dealership to avoid such a situation. Researching is not a simple act of knowing more about your purchase. It is a part of the bigger experience called car buying. Research being the first part of this experience gives you the room to weigh your needs against various cars to see which one suits you best. Someone who travels frequently will consider buying a car with bigger boot or more fuel economy. A lone commuter would be more interested in a small car that can weave through traffic and fit into tight parking spaces. Do you know which car you need? Buying a car entails more than just spending money on a box with four wheels. It is about knowing more than what the sales guy will tell you. With research done before hand, you will ask informed questions such as the car's service cost, instead of just asking about its mileage or its features. As a bonus, this will help you know more about the car than what is written in the brochure which is what you should be there for. Many times a customer walks into the showroom thinking a less popular car would be discounted, only to be disappointed later. Prior research lets you know which car can be had with discounts and the extent of discounts too. These discounts could range from loyalty bonuses to corporate benefits. Inquiring about these things can help you understand whether you should consider buying another car of the same segment if you get a better deal on the competitor's vehicle. When you just go straight to a dealership, one of the thoughts you have in your mind is the car's advertised price. Little do you realise that there are other costs involved such as registration, insurance, extended warranty, etc. You may also require a few accessories such as floor mats, seat cover, car cushions, etc., which push up the car's cost. 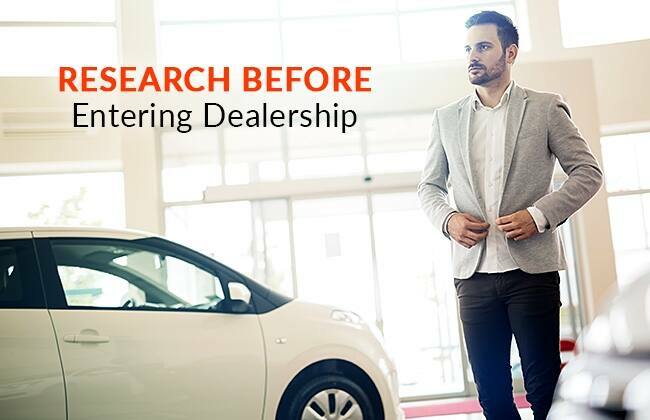 Gathering information prior to entering a dealership helps you in understanding all these aspects. This, in turn, will help you negotiate a good deal. You can also ask about various financing schemes available on the car, the paperwork needed and the term of finance. To sum up, do not ignore the importance of research when buying a car. And do visit CarDekho.com or download the app to know car prices, specifications, compare features and explore other details. In fact, with our Feel The Car feature, you can even take a 360-degree tour of the car’s exterior and interior from the comfort of your home! What more can you ask for to make your car research easier? These are just some of the tips that prepare you for the car-buying experience. Feel free to suggest any points which you think are important in the comments below. Happy car buying!